Madison Watson works two jobs and serves as president of the Campus Activities Board on MGA's Warner Robins Campus while pursuing her Bachelor of Science in Nursing. Full Name: Madison Kylie Watson. Hometown & Residence: Fort Valley. High School: "I attended Peach County High School and graduated in 2016. I was on the varsity softball team all four years and received the Best Offensive Player award twice as well as being selected for the All-Region team. I was also Peach County High school FFA chapter president. In FFA I showed dairy cows and also received a scholarship to attend the 2015 Washington Leadership Conference. In 2015 I also attended the National FFA convention as one of Georgia’s delegates." Family: Mother, Charlotte Watson, father, Lance Watson, and sister, Shelby Watson. Employment: "I work at a plant nursery as a plant propagator, but I am also a student worker on the Middle Georgia State Warner Robins Campus for the Office of Student Life." Degree Objective: Bachelor of Science in Nursing. Activities: "I am president of the Campus Activities Board (CAB) for the Warner Robins Campus." Career Goals: "I plan on becoming either a pediatric nurse or a nurse in labor and delivery. Kids have always had a place in my heart and my hope is that I can help keep them healthy and safe so that they grow up and rock the world." She chose Middle Georgia State University because … "When making my college decision out of high school I chose one that would help me do what every freshman college student wants - get away from mom and dad for a little while. After my first semester away from home I realized I chose the wrong college for the wrong reasons, so I decided to come home and start fresh at Middle Georgia State University. It was one of the best decisions I have made." The greatest thing she discovered about Middle Georgia State was … "It is such a comforting environment. There are so many kind and inviting people making it easy to make new friends and taking away the stress that I had about starting at a new college." 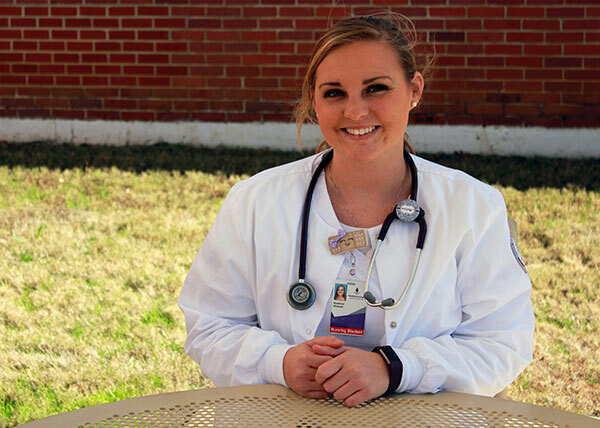 Her greatest academic experience so far as a Middle Georgia State student has been … "Getting into the BSN program. The required classes to get into the nursing program were challenging, which made it even more of a proud moment for myself for getting accepted into the program." To her, “greatness” means … "Continuing to achieve the goals that you set for yourself after experiencing troubles and hardships along the way." In five years … "Nursing is a profession where you learn more and become better by gaining experience. So, after I graduate, I plan on taking the time to become a better nurse, enhance my skills, and pick a specialization. Being the person that I am and having the drive that I have, I’ll most likely end up back in school furthering my education and getting my master's in nursing."